We are situated in the Little Don Valley near Stocksbridge, Sheffield, on the edge of the Peak District National Park. Both farms fall within the LFA and stock is reared at an elevation of 800-1000 feet above sea level. Our farms are set on south-west facing slopes over-looking Underbank Reservoir, which is a beautiful location, but which the locals refer to as being "a bit out of doors" in the winter-time! For many years, we have been committed to producing performance recorded breeding stock for commercial farmers who are keen to supply lambs of quality which will meet the required specification for conformation and fat depth. John Key and Fiona Hall live at Garfield House Farm and manage the Midhope Flock of pedigree Suffolks, founded in 1982, and currently have 60 breeding females, plus followers. 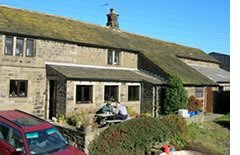 Bob and Anne Payne live at Carr Head Farm and manage the Handbank flock of pedigree Texels, founded in 1982, and have 70 breeding females, plus followers. For twenty years, our flocks have been Signet recorded. This has included a programme of recording birth weights, 8-week weights, and at 21 weeks all lambs are weighed and ultra-sonically scanned to measure muscle depth and fat depth. Through the use of reference sires and AI, both flocks are well-connected with other flocks within the breed and the level of accuracy is high. In recent years, both flocks have produced tups which have gone on to be selected as Reference Sires within their respective schemes. Quality Suffolk, Texel Shearling and Ram Lambs.